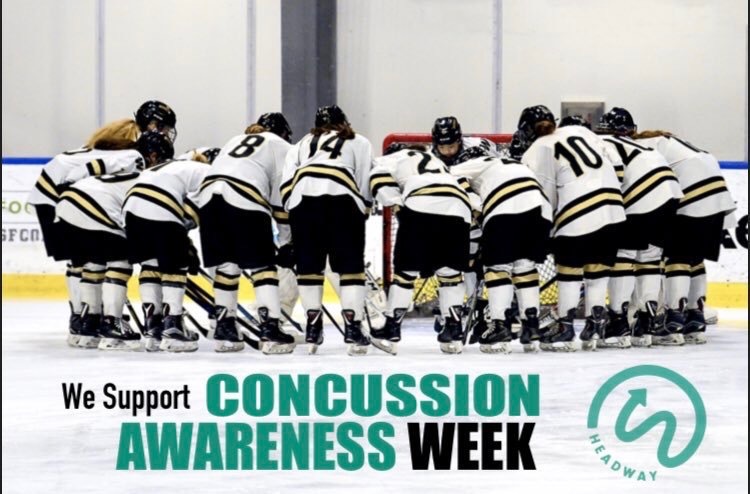 Concussion Awareness Week 2019 - A Big Success! Last week, Jan 28-Feb 3, The Headway Foundation partnered with 175 winter sports teams for our Third Annual Concussion Awareness Weekend. The week was dedicated to athletes promoting a safer sports culture surrounding concussions through education with a focus on symptom reporting and supporting teammates during recovery. The event featured repeat participation from a number of teams, including the ECAC, NCHC, and WCHA conferences. We were also proud to welcome new participation from teams in the ECHL, Hockey East, NESCAC, Atlantic Hockey, New England Prep, JWHL, club hockey, and youth hockey teams. While ice hockey was the dominant sport represented, we also saw participation from basketball, wrestling, gymnastics, squash, swim and dive, track and field, and even a triathlete. Over 4,500 student-athletes involved were encouraged to take the New Tough Pact and wore the signature Headway sticker on their hockey helmets, jerseys, or water bottles as a symbol and a reminder of their commitment to handle concussions properly. Participation in the New Tough Pact took a strong leap forward in this year’s event. "We are thrilled to see the growth and participation of so many teams during our third annual Concussion Awareness Weekend,” said Paige Decker, Headway Co-Founder. “The sheer number of athletes rallying behind this weekend is a testament to the progress being made about the proper ways to handle concussions in sports, and we are grateful to be involved with the movement." We are incredibly grateful for the outpouring support for our message that participating players and teams expressed through social media. The CDC estimates that 69% of student athletes neglect to report possible concussion symptoms, and Headway’s encouragement towards social media efforts were geared towards challenging this stigma. Check out the highlights from our Concussion Awareness Week and hear what New Tough means to each team below! This year we were also pleased to launch a Player Feature Series showcasing Team Reps and their stories once a week. We will be continuing to share inspiring stories of what it means to be New Tough to add the voice of current athletes to the concussion conversation. Team Headway would like to extend our thanks to everyone who helped make this week possible. Our Team Reps are the driving force behind this event and each year they deliver despite hectic lives as student-athletes. We couldn’t do it without you!